'A brilliant and scholarly microcosm of a literary world.' 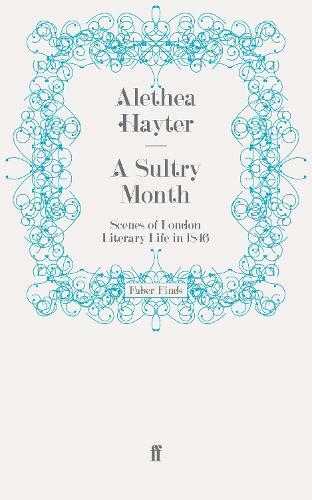 Sunday Telegraph 'Alethea Hayter's skill and insight are outstanding, her work is a small masterpiece.' Anthony Burgess, The Bookman June 1846 was a month of fierce heat and political crisis in London. This sultry month was also a time of personal crisis for Carlyle and his wife, for Browning and Elizabeth Barrett and notably for the painter Benjamin Robert Haydon. A cross-section of the close-textured life of literary London in the 1840s is tellingly portrayed. Dickens, Tennyson, Browning, the Carlyles, Monckton Milnes, the actor Macready, Mary Russell Mitford, Wordsworth and Samuel Rogers frequently met during these sweltering weeks, particularly since many of them felt constrained to give parties for the best-selling German novelist, the preposterous, one-eyed Grafin Hahn-Hahn, and her travelling companion Oberst Baron Adolph von Bystram. The secret crises and decisive actions of the members of this group affected them all, as did the weather and the political situation. The catastrophe which overcomes Haydon is, however, the central leitmotif. A fascinating and stimulating book based on contemporary letters, diaries, memoirs and newspapers, A Sultry Month pioneered a new form of group biography when it was first published in l965, which has since influenced many writers and scholars.